"I would absolutely say that BrightEdge is an innovative company. 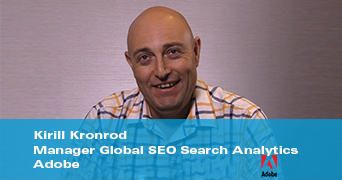 They’re leading the SEO reporting industry completely." To provide BrightEdge customers with closed-loop solutions for search engine optimization and content marketing, we developed a strong partnership with Adobe. BrightEdge is an Adobe Accredited Application Partner with a five-year history of developing integrated offerings. Bring your analytics data into BrightEdge and align organic search performance with key website metrics. Identify underserved user intent, prioritize SEO opportunities, and accelerate website traffic, conversions, and revenue. Learn about our Adobe Data Warehouse integration. Pull BrightEdge Content Optimizer’s intelligence seamlessly into Adobe Experience Manager and optimize content as it’s being created. Identify topics that are high in demand and low in competition and pair them with targeted web pages to improve organic search and customer reach. Learn about Content Optimizer in Adobe Experience Manager. Learn how Adobe uses the BrightEdge platform to drive successful SEO programs and accomplish double-digit growth in organic search.